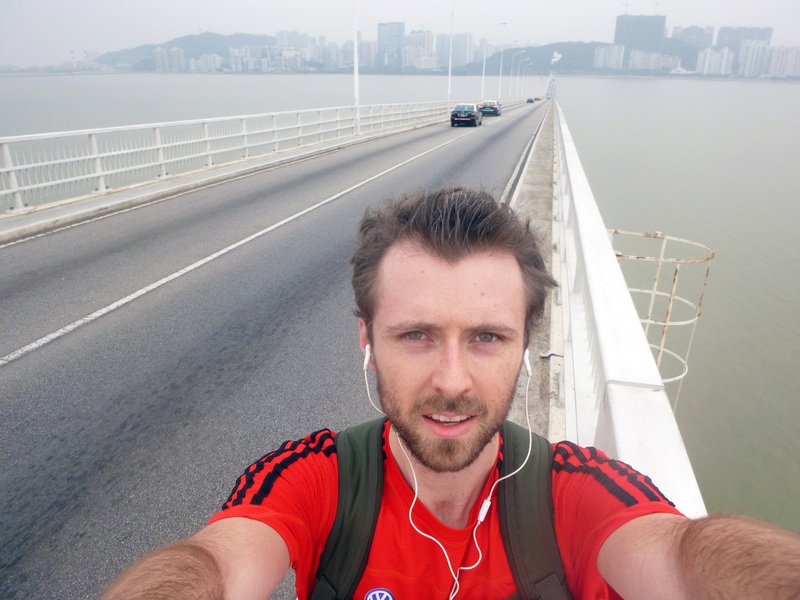 Macau was to be my second half marathon in a day. 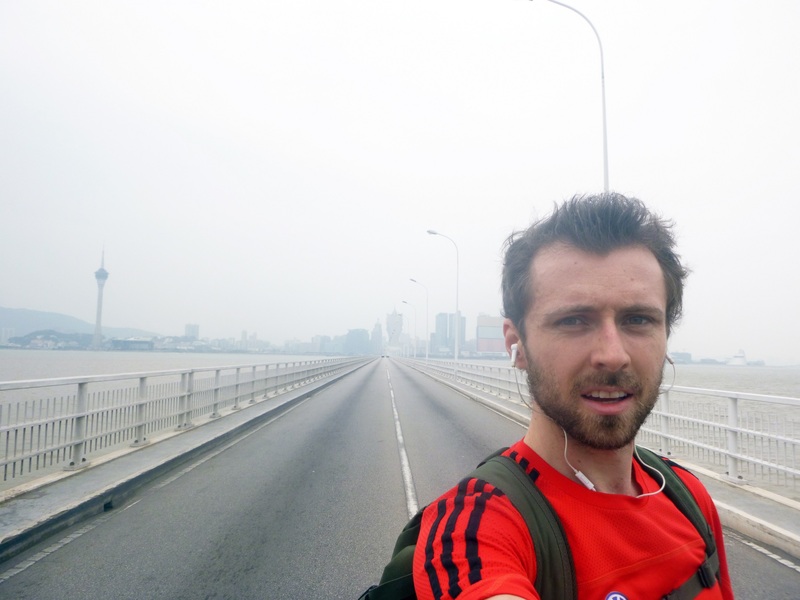 Considering I genuinely didn’t know where in the world Macau was 2 days earlier, I found myself almost chuckling at the absurdity of getting an hour long boat journey at the crack of dawn just to run around a country (ok, a ‘special administrative region’ if you want to be pedantic. To me, it’s a separate country!) of which I knew absolutely nothing. Macau Grand Prix starting line! 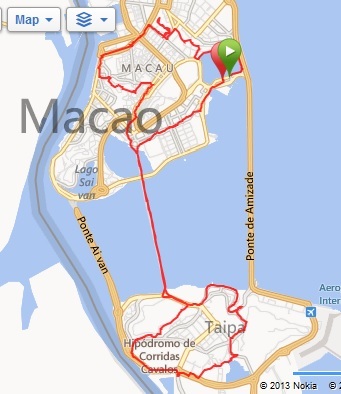 After we docked up at the harbour, I grabbed a tourist map, drew a rough outline of what I thought looked like 20-odd kilometres and headed to the starting line of the ‘Macau Grand Prix’ which, conveniently, was right next to the harbour. Vroom vroom, off I went! 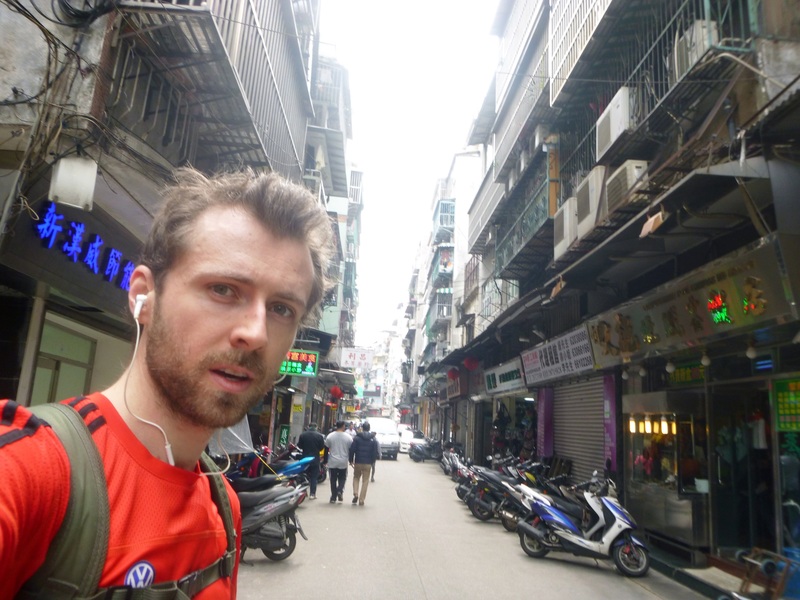 Macau is similar to Hong Kong except with slightly fewer steroids. It also used to be Portuguese which makes the road signs in Portuguese and Chinese unusual. It is also slightly less developed. It’s also known as the Las Vegas of South East Asia for all of its casinos. It also has pandas. It’s also a lot flatter. Ok, after all, it’s not that similar to Hong Kong! More interestingly, it’s also the most densely populated place on earth! 582,000 people squeeze into a territory only 29km2 which means that, on average, 20,000 people live in each km2! Which is truly mental. So, map in hand, bag on back, off I went. I looped the reservoir and headed into what seemed like the main town on the North Island. 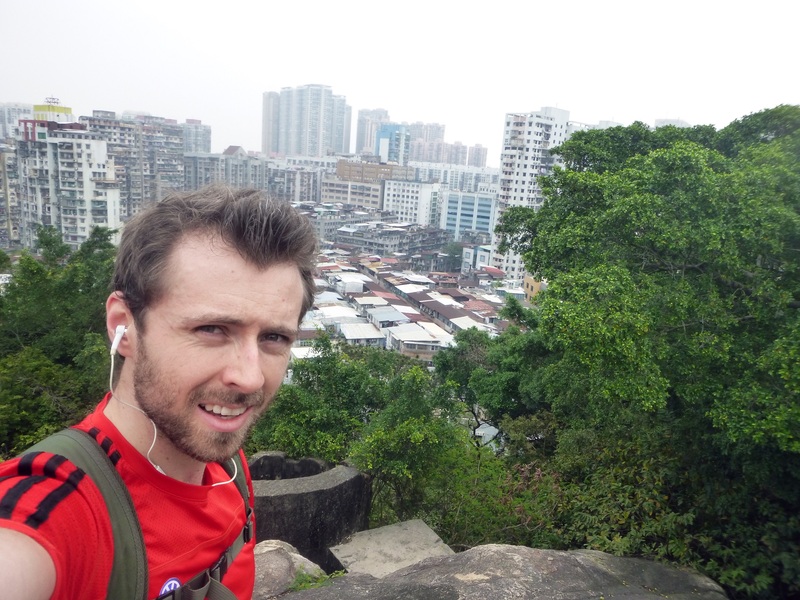 I ran up to the Mong-Ha fort and down along the ‘Avenida do Almirante Lacerda’ high street (with a name like that, he must have been a great Ming Dynasty leader…) to the ruins of St Paul’s Church and the Monte Fort, a pretty cool fort which gives a (very hazy) view of almost all of Macau and roughly one millionth of China! 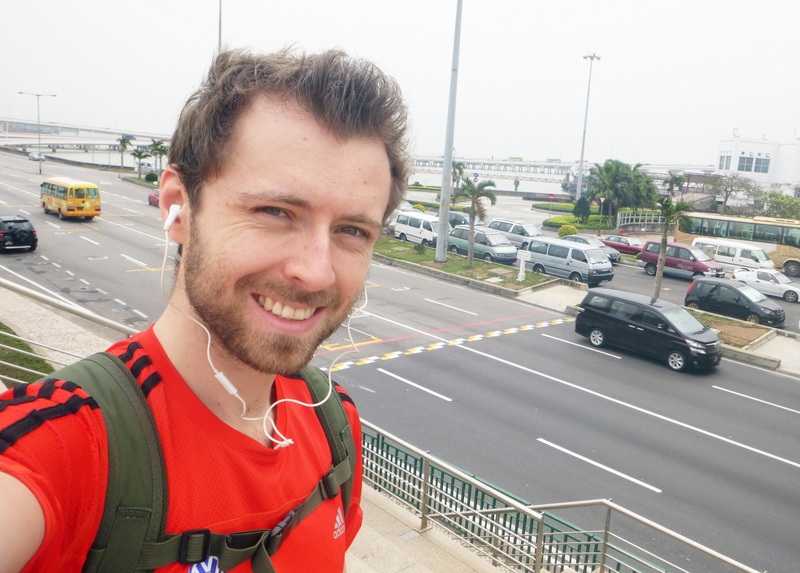 After that, I got a little lost in the backstreets, got stared at up and down by a few locals and eventually found my way to the giant Grand Lisboa casino, which is at the gateway to … the southern island. There used to be three islands but, because they are so densely populated (and they can make more money by reclaiming land and building a new casino), they merged the southern two islands into one! 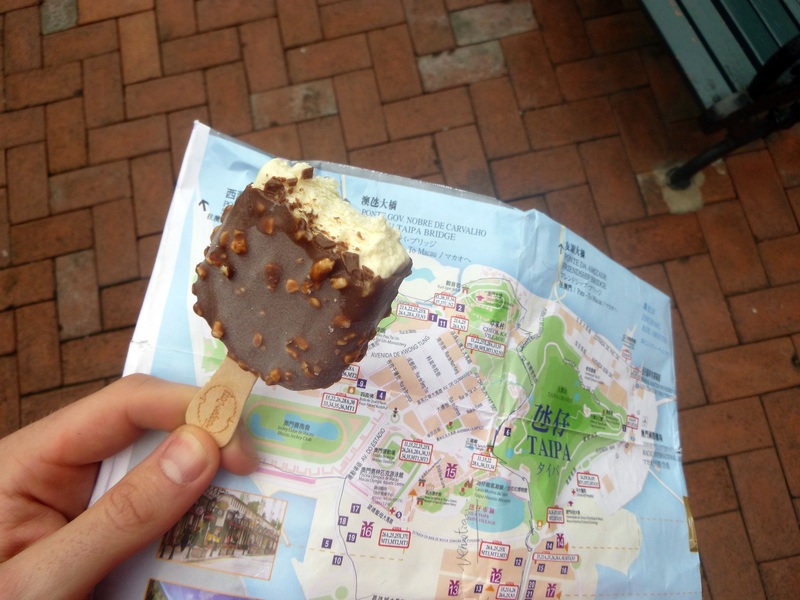 Haagen-Daas: the lunch of champions! As I curled around the west coast of the southern island, my energy levels were starting to drop and I was getting desperately close to needing an energy boost. I was getting that desperate that I was only about a minute away from walking into a McDonald’s – the first shop I’d spotted in the previous 45 minutes. Thankfully, hidden behind it was a small local (well, American) mini-market. So, sandwiches and Haagen-Daas it was: the original lunch of champions! 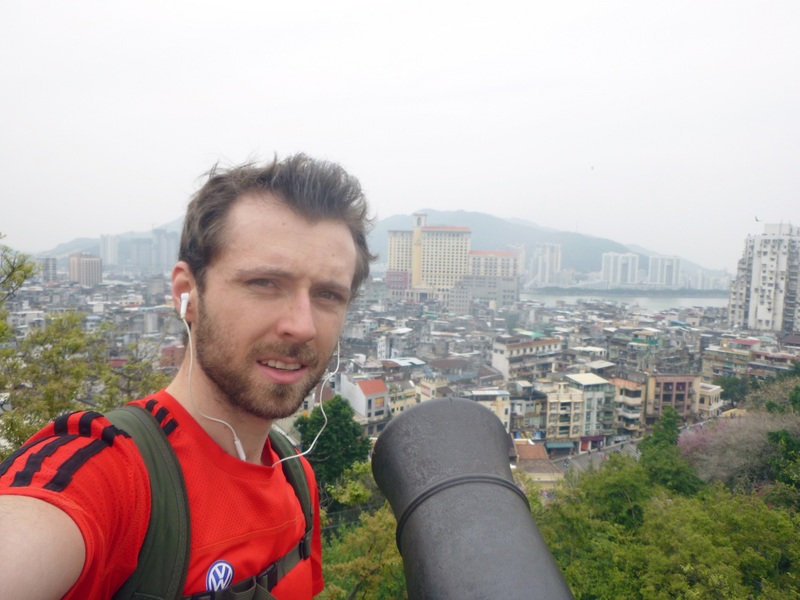 Feeling slightly less faint, I hit the road again past the Taipa Houses Museum and more high rise buildings and got on my way back towards the north island and the boat home. From all the farting around with my camera and seeing sights, it was getting a little touch-and-go to catch my boat home but, with a little luck, I found the route again, crossed the GP finish line and hopped on board! This was most likely the most bizarre run I’ve done to date but also one of the most enjoyable: just me, ageing legs, interesting sights, all the while relishing the time alone and breathing in the invigorating (acrid) air. No speed or finish line targets, just a real sense of freedom. Then again, maybe three weeks of breathing in Indian, Malaysian, Indonesian and more-or-less Chinese air was finally starting to affect my neurological capacities! It was certainly doing its best at destroying my lung capacity. On a final note, if there are other weirdos like me out there, I should start a ‘Running Tour of Edinburgh’ business! Sooo…. do I go left, right or straight here?